So, it’s finally here. Marvel fans have been waiting some time for this film. Ten years to be exact. Since Iron Man released back in 2008, Marvel Studios took Hollywood by storm. 17 films later, Infinity War arrives, weaving numerous storylines together. While this ending was imminent, it is still a tall order to bring it all full circle. Despite a few dud sequels here and there, I enjoy Marvel movies. Over the years, they’ve become polarizing. The hype machine Marvel produces is excessive. Following their merger with Disney, superheroes lost their edge. I get it, though. It’s for the kids’ sake. Regardless, many Marvel films layer a cheesy gloss on their scripts. I must admit, this redundant formula grows thin sooner rather than later. However, it has only ruined a minority of the MCU. For me, Dr. Strange’s movie suffered the most from this. He became Tony Stark Junior. Strange and Stark go head to head in this latest offering. Insults fly in typical fashion. But I guess that makes sense. Tony would certainly reject anyone he thought might have better hair or wittier comebacks. Alas, allow me to begin this review in chronological order. The film’s first scene caught my attention. Following the events of Thor: Ragnarok, the God of Thunder’s home of Asgard is in shambles. Thanos, a power-hungry being from the planet of Titan, visits the destroyed paradise. He searches for Asgard’s coveted Tesseract. Within it lies an Infinity Stone. Collecting all six of these stones across the universe grants their possessor ultimate power. While Thor and his brother Loki recover from their sister’s rampage, Thanos takes advantage. He threatens to kill Thor unless Loki unveils the Space Stone’s whereabouts. In spite of his selfish nature, Loki obliges. This scene intrigued me overall. However, distracting camerawork set a grueling tone for the film. When you watch a movie, do you notice how the camera moves? Or how often the film is cut and spliced? Well, I do. Cutting from sequence to sequence in a scene helps deliver suspense when executed correctly. Frequent quick cuts feel choppy, antsy, and frantic. At times, these are the emotions intended to connect a particular scene. Nevertheless, Infinity War’s lack of fluid camerawork hinders it from functioning as an immersive film experience. Each time a frame cuts, your eyes must readjust from a sharp change. Although in doses this does not affect a film’s greater appeal, a superfluous amount distracts from a scene’s emotion. Marvel usually does a poor job eliciting genuine emotion. Attention to filmmaking details resides on Marvel’s back-burner in exchange for dull jokes and Easter egg dialogue. Additionally, this movie’s sound design greatly underwhelmed me. Throughout the 156-minute runtime, sound is seldom complementary. To me, this score felt like a compilation of title screen music copied and pasted from past Avengers films. Not once did the music here evoke a heightened sense of emotion. A compelling score places you in the moment. Scenes blend into each other here due to Disney’s refusal to take risks. It’s the same old music, same old jokes, and the same old formula. People eat it up. If you’re one of those people, that’s okay. You might enjoy setting and meeting an expectation when you head to the theater. I, on the other hand, seek more from my viewing experiences. That doesn’t make me any cooler, or better, or more “deep” than anyone. However, it does make me a more insightful critic. That said, this movie offers little in terms of storytelling and aesthetics. As the second-most expensive movie ever made, Infinity War features flashy special effects. I anticipated this going into the theater. So, the hefty amount of CGI didn’t bother me. Thanos looked convincing enough even for two-and-a-half hours. Compared to Justice League’s Steppenwolf, Thanos passes with flying colors. During his universal scavenger hunt, the cynical Titan risks everything to gain ultimate power. With all six Stones at his disposal, Thanos aims to wipe out half of the universe’s population. This strategy has apparently been his goal from the beginning. He sees the universe as a finite reservoir in need of preservation. While this makes sense in theory, in practice it tears families apart, scarring them for life. Their suffering means nothing to Thanos however. His misguided “heroics” mirror those of other movie villains. Perhaps this is commentary on the current state of our planet. Killing trillions of living creatures sounds pretty dire, right? I think so. Unfortunately for viewers, this film makes a lackluster effort of capturing accurate urgency. Numerous characters tell us that the universe is danger over and over again. 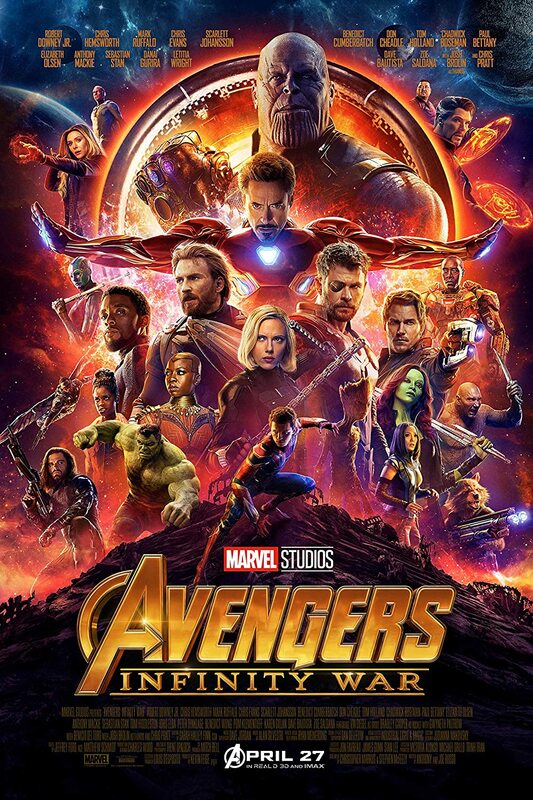 Though when the time comes to show how drastic the Avengers’ situation is, Infinity War shits the bed. Like I mentioned before, the music doesn’t help anything here. Action sequences are abundant yet dull. These fight scenes are not immersive. The only thing missing from them was the director yelling “Action!” or “Cut!” This was as phoned-in a film as I’ve seen in a while. This wasn’t always the case, but most of the time scenes felt scripted. You might be saying to yourself: But Kam, this is a movie; everything is scripted. I agree. However, a movie isn’t supposed to feel scripted. It’s supposed to take you to another world and forget about your contemporary one for at least an hour or so. Most of these actors appeared fed up with their roles. Chris Evans’ Captain America is tired and dry. Dude checked out two movies ago. Paul Bettany’s Vision performance is less interesting than a Raptors-Jazz Finals matchup. And Elizabeth Olsen, although she is bae, plays a glorified side MacGuffin heroine. She’s so powerful yet so stale at the same time. Additionally, the horrendous Russian accent she sported in Age of Ultron magically disappears in this film. Did they think no one would notice, or was it simply too bad to continue? They’re fortunate nobody cares about her character. Robert Downey’s Iron Man is second nature at this point. He never disappoints. Tom Holland as Spidey was solid as well. His overdramatic exit left a bad taste in my mouth nonetheless. Despite my laundry list of complaints, there were positive takeaways here. The banter between Thor and the Guardians of the Galaxy was entertaining. Rocket and Thor were great together. Although Chris Pratt’s Star-Lord suffered in a lesser role, the Guardians as a collective extended their streak of funny moments. Any time Black Panther shows up, it’s a good day. While he should’ve had more screen time, Chadwick Boseman’s role sufficed. And teenage Groot never overstayed his welcome. Even though Infinity War held my interest, it featured zero signature moments. We know there will be a second part to this finale. They know we know. But just because this film wasn’t meant to stand alone does not excuse its mediocrity. All Infinity War accomplishes is hyping us up for round two. Personally, I’m sick of waiting for passable movies.